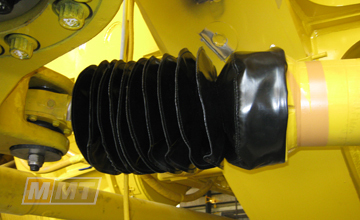 The MMT team has developed a range of protective ram covers which reduce wear on hard chroming and seals, and protect machinery from flying rocks, salt, chemicals and dust. 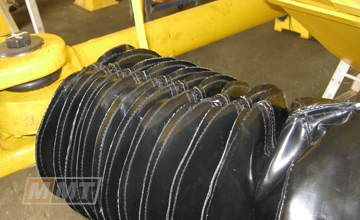 Made from a range of materials including PVC, Nylon and Kevlar®, the feedback received from our mining clients has been extremely positive, with reduced down-time and extended wear life reported on cylinders and other components, in addition to increased productivity. One of our valued customers has reported ‘tripling the life’ of their rams and in the process saving labour time, increasing the machine’s working hours, and reducing replacement times. Our protective cylinder ram covers are just one of the custom mining solutions we provide so for full details and availability call us on 08 9361 7646.